A large family of mushrooms with over 60 related species. Most of them are edible, and notable among them are the b. edulis, b. aereus, b. estivalis and b. pinicola varieties. For culinary purposes they can be used fresh, dried or frozen to complement risotto, pasta, meats, cheese, omelets, legumes, vegetables, sauces or garnish. The best in quality (regardless of shape) are the small ones, whose lower part of the pileus (cap) is whitish and darkens as the mushroom grows. While growing, the mushroom’s aroma changes aswell and tends to get ‘heavier’. 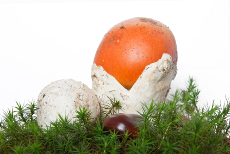 ‘Ovuli’ means ‘eggs’; the common name of this fungus in Greece is αυγομηλακι” (egg-apple) because of the way young mushrooms look: when they emerge from the ground, their orange-red cap is wrapped by a white universal veil, which makes them look like eggs. Their gills are always yellowish, and they keep that color even when boiled, giving the dish they complement an aesthetically pleasing and tasteful result. As with Boletes, the smallest Caesar’s mushroom are considered to be of the highest quality, since they keep their aroma and taste unspoiled. Another mushroom family with several similar varieties, of which notable are the morchella conica (black morel), morchella rotunda, morchella esculenta (yellow morel). It is probably the mushroom with the strongest taste in cooking, as it can ‘cover’ the taste of other ingredients, dominating the dish with its classic mushroom taste. It is used in remarkable combinations with crème fraische, demi-glace, feta cheese and lamb sweetbreads. Other than these, the combinations with this mushroom are virtually endless, as it absorbs the taste of other ingredients while keeping its own. Its Greek common name is “λειρί του κόκκορα” (rooster’s comb) or “κανθαρίσκος” (little cup), due to its shape. Fruity and crispy mushroom, with a sensitive flowery aroma, that cannot be frozen or dried for long periods. Ιt is better used while fresh or slightly cooked, combined with pastries, salads, fish, light meat, in sauces or garnishes. If, however, it is used after being frozen, it would be good to change the water used for thawing often, as it leaves behind a bitter taste (this can be avoided if the fungus is fried before being frozen). The ancient Greeks called this mushroom ‘cornucopia’ or ‘the horn of Amalthea’ (Amalthea was the goat-nymph that fed its milk to the newborn Zeus using her cut-off horn). Indeed, it has a remarkable culinary relation to milk: when boiled together, the cream acquires a vanilla-like taste, and the same can be said for creamy cheeses (manouri, Philadelphia, cottage cheese etc.) 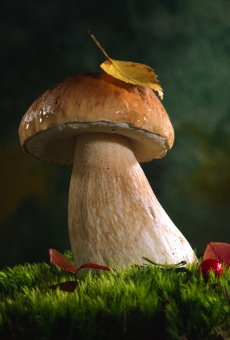 So, this mushroom can yield unprecedented tastes in pastries, sauces, dressings etc. when combined with dairy products, or it can complement and sweeten dishes with fish, seafood or meat when used as a different type of vanilla. It is also commonly known as black chanterelle, black trumpet, trumpet of the dead. 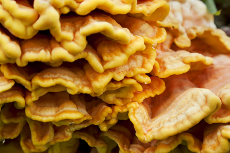 The common name for this fungus is ‘crab-of-the-woods’ or ‘chicken-of-the-woods’. Its taste resembles the taste of chicken, though it is more fruity and crispy. It is always found growing on tree trunks and it needs to be boiled (by itself or in broth) before used in the kitchen. It can also stay frozen for long periods of time without spoiling. This fungus is highly sought-after in the US and the UK. Its name derives from the harvest season, which is right after the snow melts in mountainous areas of high altitude. 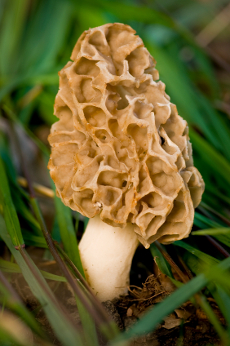 If the French consider the morel as the best mushroom, as Italians do with the porcino (bolete), the Swiss save their No1 spot for this fungus, and rightly so, as its aroma is very intense and totally different than any other mushroom; it resembles a spring bouquet of flowers, and its flesh is crispy. Its culinary use is best when accompanying game, poultry or any other strong taste.